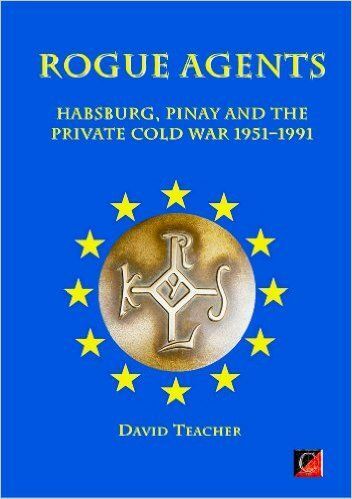 Rogue Agents: Habsburg, Pinay and the Private Cold War 1951-1991 by David Teacher, Kindle, December 2015. The Cercle Pinay was founded in the early 1950s as an elite clandestine forum to promote the vision of a Catholic and conservative Europe and to oppose the threat of Communism. Shrouded in secrecy, the Cercle brought together statesmen such as Antoine Pinay (1891-1994, French Prime Minister from 1952-53, https://en.wikipedia.org/wiki/Antoine_Pinay), Konrad Adenauer (1876-1967, West German Chancellor 1949 to 1963, https://en.wikipedia.org/wiki/Konrad_Adenauer), Franz-Josef Strauss (https://en.wikipedia.org/wiki/Franz_Josef_Strauss), Giulio Andreotti (1919-2013, Italian prime minister 1989 to 1992), https://en.wikipedia.org/wiki/Giulio_Andreotti), Otto von Habsburg (“Archduke Otto of Austria” 1912-2011, https://en.wikipedia.org/wiki/Otto_von_Habsburg), Henry Kissinger and David Rockefeller, as well as top figures from the American and European intelligence services. Following the rise of student counter-culture in the 1960s, the Cercle focused on domestic subversion, using its network of propagandists and intelligence operatives to smear progressive politicians such as Willi Brandt, François Mitterrand, Harold Wilson and Jimmy Carter and to promote their favoured candidates: Ronald Reagan, Margaret Thatcher, Giscard d’Estaing and Franz-Josef Strauss. Throughout the 1970s, the Cercle also worked to defend apartheid South Africa and Franco’s Spain. After the electoral victory of the Right in 1979-1980, the Cercle targeted peace campaigners and the new Soviet regime under Mikhail Gorbachev, playing a key part in the fall of the Iron Curtain and then ensuring the integration of Eastern Europe into the European Union. In a groundbreaking twenty-five year investigation, the author lifts the veil of secrecy to reveal the unseen rôle played by the Cercle and its allies in shaping the Western world as we know it today. ROGUE AGENTS 4 Fourth and final edition, December 2015 © 1993, 2008, 2011 and 2015. All rights strictly reserved. Dedicated to seven courageous people in whose debt we all stand: Colin Wallace, Cathy Massiter, Mordechai Vanunu, Julian Assange, Chelsea Manning, Peter Francis and Edward Snowden. no country is an island. This is nowhere more true than in the field of parapolitics, the networks of unofficial power that, usually via serving or retired friends in the world's major intelligence and security services, exert greater influence than is generally realised on national political life. Both the private networks of influence and the intelligence services work internationally; more often than not, they work hand in hand in a shadow world that brings together top politicians and veterans of covert action, counter-subversion and media manipulation. An investigation to delineate such networks of covert transnational cooperation must, to succeed, tackle the complexities of the unseen political world in many countries. This study is an attempt at a preliminary transnational investigation of the Paneuropean Right and particularly of the covert forum, the Cercle Pinay and its complex of groups. Amongst Cercle intelligence contacts are former operatives from the American CIA, DIA and INR, Britain's MI5, MI6 and IRD, France's SDECE, Germany's BND, BfV and MAD, Holland's BVD, Belgium's Sûreté de l’Etat, SDRA and PIO, apartheid South Africa's BOSS, and the Swiss and Saudi intelligence services. Politically, the Cercle complex has interlocked with the whole panoply of international right-wing groups: the Paneuropean Union, the European Movement, CEDI, the Bilderberg Group, WACL, Opus Dei, the Moonies, Western Goals and the Heritage Foundation. Amongst the prominent politicians associated with the Cercle Pinay were Antoine Pinay, Konrad Adenauer, Archduke Otto von Habsburg, Franz Josef Strauß, Giulio Andreotti, Manuel Fraga Iribarne, Paul Vanden Boeynants, John Vorster, General Antonio de Spínola, Margaret Thatcher and Ronald Reagan. ROGUE AGENTS 564 ROGUE AGENTS The Cercle and the 6I in the Private Cold War The Cercle Pinay was founded in the early 1950s as a clandestine forum of European leaders who aimed to promote the vision of a Catholic and conservative Europe and to oppose the threat of Communism. Shrouded in secrecy, the Cercle brought together statesmen such as Antoine Pinay, Konrad Adenauer, Franz Josef Strauß, Giulio Andreotti, Otto von Habsburg, Richard Nixon, Henry Kissinger and David Rockefeller, as well as top figures from the American and European intelligence services. Following the rise of student counter-culture in the 1960s, the Cercle focused on domestic subversion, using its network of propagandists and intelligence operatives to attack progressive politicians such as Harold Wilson, Willy Brandt, Jimmy Carter and François Mitterrand, and to promote their favoured candidates: Giscard d'Estaing, Margaret Thatcher, Ronald Reagan and Franz Josef Strauß. Throughout the 1960s and 1970s, the Cercle also worked to defend apartheid South Africa and the dictatorships in Spain and Portugal.